With the drastic change in temperatures in the last few days it is hard no to think that cold and flu season is going to be in full swing. Not to mention that many people around me seem to have the sniffles and throat tickle. Although we don't have to contend with school germs as we are homeschoolers we are still out and about the city every day coming into contact with many people in our travels. This year I am planning on taking a preventative approach to cold and flu season. I plan on resting when I feel a cold coming on, taking more fluids and taking some Echinacea to help give me a boost. What does Echinacea do? 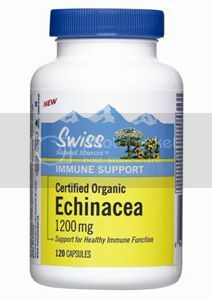 Visit Swiss Natural website to find out more about Echinacea and other great products. Consult healthcare practitioner if symptoms persist or prior to use if you have auto-immune disorders or progressive systemic diseases such as rheumatoid arthritis, tuberculosis, leukosis, collagenosis, multiple sclerosis, AIDS, HIV infection or if you are taking immunosuppressants. Do not use if pregnant/breast feeding or allergic to plants of the Asteraceae/Compositae (daisy) family.